Doyle CFD came to us for help communicating and connecting with untapped audiences for their engineering and design services. Using digital simulations, Doyle CFD analyzes the hydrodynamic and aerodynamic forces on designs to improve performance with more precision, for less cost and faster than what is possible in real world testing. They faced a challenge of conveying the breadth of possibilities of their technology – their CFD processes benefits everything from 300ft mega yachts to formula 1 cars to helicopters. Doyle CFD wanted to strengthen their appeal to the traditionally core industries with which they work with, while also communicating capabilities in other application areas. To ensure the site effectively conveyed what Doyle CFD does, we focused the above the fold section of the homepage on what they do and the broad benefits that apply to all applications. As users continue down the homepage, we offered them paths to all application specific services, with visual prominence given to their core focus. In order for users to fully understand the breadth of what they do, we created a project portfolio navigation that allows users to filter by industry or a specific service. This permits users to locate past projects that were similar to their own. Overall the new design establishes a sophisticated brand that complements the innovative engineering work for which the firm is known. 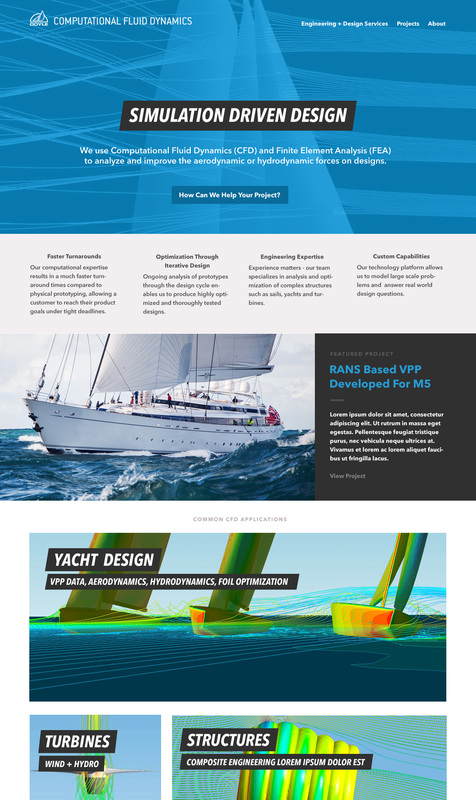 The site also achieves a balance of technical depth for the engineering audience with readability for business users. The site is ultimately a marketing and lead generation tool, so integrating prominent contact options throughout the site as a natural next step for users was critical to the project.